Quantum states have been shown to endure in a room-temperature solid-state device for a whopping 39 minutes, shattering the previous record of 2 s. The feat was achieved by physicists in Canada, the UK and Germany, who used phosphorus atoms in silicon as their quantum bits – or qubits. The breakthrough offers hope that normally fragile quantum states could be made robust enough to be used in practical quantum computers or even in "quantum money". Quantum computers are designed to exploit the counterintuitive idea that tiny objects can exist in more than one state at the same time. Rather than processing bits – which are either 0 or 1 – such devices instead manipulate qubits, which can be 0 and 1 simultaneously. Vast numbers of operations could therefore, in principle, be carried out in parallel and rendering these devices far quicker than classical computers. But anyone trying to build a working quantum computer has to deal with the fact that qubits tend to be incredibly fragile, which means the quantum information they hold is rapidly destroyed by external noise. One way of getting around this problem is to cool the qubit to near absolute zero to minimize its exposure to thermal noise. But working at such low temperatures is not particularly practical, which is why researchers are keen on find qubits that can operate at room temperature. The new record-breaking system has been created by Mike Thewalt of Simon Fraser University and colleagues, by storing quantum information in the nuclear spins of phosphorous atoms in a silicon crystal. The idea of using these nuclear spins is not new and the system has already been shown to retain quantum information for long times at extremely low temperatures. But even at 10 K, this "coherence time" drops precipitously to just a few milliseconds. To get around this problem, Thewalt and colleagues took advantage of the fact that phosphorous atoms in silicon at room temperature tend to give up their electrons and become positive ions. Removing the electrons eliminates an important link between the nuclear spins and surrounding electrical noise. 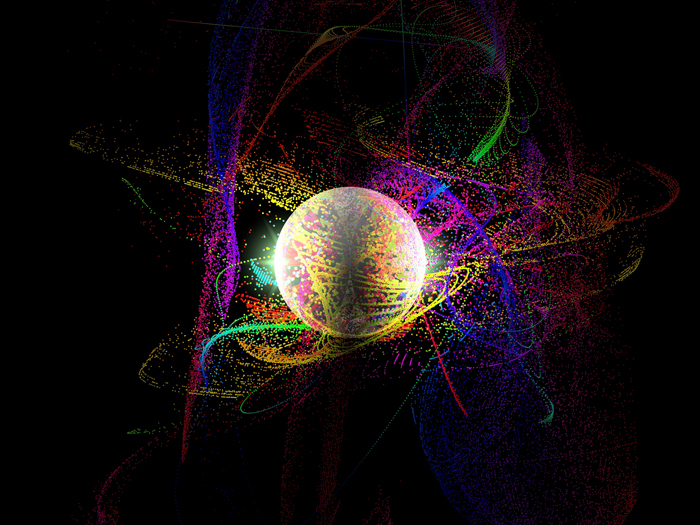 Nuclear spins can therefore retain quantum information for much longer than those in neutral phosphorous. The downside is that removing the electrons makes the nuclear spins so well isolated that they cannot be "read" or "written" to. So to get around this problem, the team first cooled its crystal to 4.2 K and used laser and radio frequency (RF) pulses to put neutral phosphorous atoms into specific quantum states. A laser pulse then ionized the atoms before the crystal was warmed up to room temperature (298 K). Under these conditions, RF pulses were used to perform a "spin echo" measurement of the coherence time, which was found to be 39 minutes. The crystal was then cooled back down to 4.2 K and another laser pulse was used to neutralize the phosphorus ions before the quantum information was read out using a sequence of laser and RF pulses. Although measurements reveal that the coherence time at room temperature is 39 minutes, team member John Morton from University College London says that under these conditions, it would be possible in principle to remove the crystal from the cryostat and carry it around the lab while the spins maintain their coherence. What's more, repeating the experiment with the sample at 4.3 K revealed a coherence time of as long as three hours. Stephanie Simmons from the University of Oxford, who is also part of the team, says that while 39 minutes "may not seem very long", it takes just 10 microseconds to flip the nuclear spin of a phosphorus ion – the type of operation used to run quantum calculations. "In theory, over 20 million operations could be applied in the time it takes for the superposition to naturally decay by 1%," she says. Morton adds that it is unlikely that anyone would build a quantum computer that is cycled between 4.2 and 298 K and so qubits based on phosphorous ions would probably be operated at cold temperatures where their even longer coherence time would be an asset. However, he points out that such a system could be used to create "quantum money", which in principle would be impossible to counterfeit. The serial number of a "banknote" could, for example, be encoded into the nuclear spins at 4.2 K before the system is heated to room temperate and carried about until it is "spent" by cooling it down. The serial number could then be read out, but a counterfeiter trying to copy the quantum serial number would be thwarted by the "no-cloning" theorem of quantum mechanics, which prevents an unknown quantum state to be copied. Although the team has shown that ionized phosphorous qubits can endure for very long times, there is more work to be done before the nuclear spins could be used in a quantum computer or quantum money. The measurements were made simultaneously on a collection of about 10 billion ions and physicists must now work out how to read and write information to an individual ion – and also how to get two or more ions to interact with each other to create quantum-logic devices. Thewalt told physicsworld.com that physicists at the University of New South Wales in Australia have already worked out a way of reading and writing information to individual ions – albeit at low temperatures – and are now looking at how they could be entangled. Meanwhile, Thewalt's team is now looking at other atoms in silicon, including arsenic, antimony and bismuth. The research is described in Science.